Writing is a strange and wondrous thing. And it has a long history. People have been using written symbols for over six thousand years. This probably started in the area of Mesopotamia, Assyria, Babylonia, and Persia. 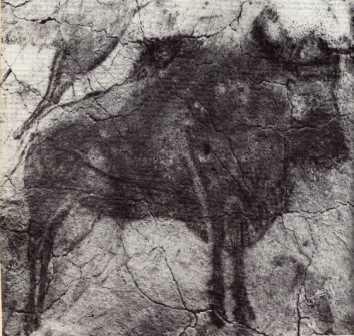 A bison drawn on the rock wall of a cave in Spain. The artist was a prehistoric human. Scientists don’t agree on what to call cave drawings— art, hunting magic, or writing. In the ancient societies, writing was a holy thing. After all, it was a way of changing the sounds of speech into visible forms. That sounds like magic, so the ancient peoples thought that writing must have been invented by the gods. Add to this the fact that the priests were usually the only ones who could do it, and writing got a big reputation. These hieroglyphics were magic to the Egyptians. The marks were not just pictures, they were the thing itself. For example, suppose that a hieroglyph for a bird had to be used in a tomb. What if the bird ate the store of grain that was being left for the dead person to use in the after world? More than that, what if the bird ate the dead body? The Egyptians thought that this was possible, so they figured out a way of preventing it. Sometimes they used an incomplete drawing of the bird. At other times they might draw the bird in two separate halves. In this way, they believed, the whole animal could not appear. In northern Europe during the early centuries of the Christian era, there were magic letters called runes. This term came from a word meaning “mystery,” or “secret.” The modern German word raunen, for example, means “to whisper.” Runes were used inside a tomb to keep evil spirits away from the body or to prevent the body from leaving the burial place. This is another example of the belief that writing is powerful. Runes were used on weapons, too. One warrior named his sword “Marr,” and wrote on it, “May Marr spare nobody.” Runes were said to be able to bring the dead back to life. 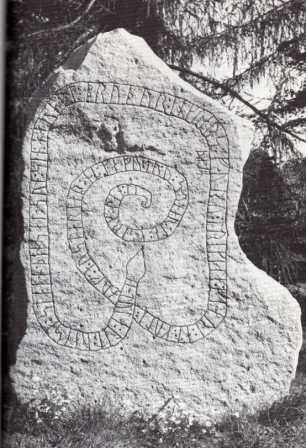 Runes carved on a stone in Gripsholm, Sweden. When northern Europe became Christian, the early priests outlawed the writing of runes. There was too much of a connection between these markings and pagan religions and magic. In Iceland, as late as the seventeenth century, people were burned at the stake if they were caught with some runes. In a way, writing goes back further than just to the ancient tribes of the Middle East. Drawings dating back to 20,000 B.C. have been found on the walls of caves. Not only were there pictures of animals and humans, but there were also geometric shapes and patterns. They are thought to have religious and magical significance. 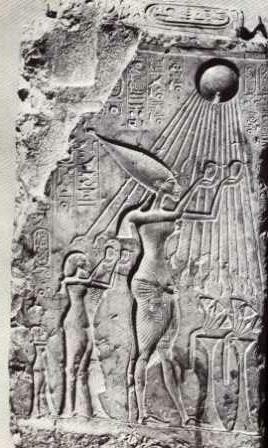 The pharaoh Akhenaton and Queen Nefertiti of Egypt making an offering to the sun god, Aton. The symbols in columns above their heads are hieroglyphics. The second type of writing was the ideograph. Take the picture for the sun in the last paragraph. In ideographic writing, the drawing means not only the sun but also some of its characteristics. “Light,” “heat,” “brightness,” and “day” are examples of these new meanings. The picture of the star may also refer to heaven, or even God. Ideographic writing is complicated. When you see a picture of the sun, how do you know whether it means “day” or “hot”? The drawing can have several different meanings. And then there is the problem of abstractions. How would you draw a picture of the words “truth” or “justice”? The answer, of course, is the phonetic type of writing, such as we use now. Here we have symbols that stand for sounds, not things. We have twenty-six symbols in English—called the alphabet. Other Western languages have about the same number, give or take a few. Many scholars think that all of the alphabets of the world are descendants of one original alphabet. This first alphabet was probably invented in either Syria or Palestine sometime between 1750 and 1500 B.C. We no longer think that writing is a magic thing, but there are many people who think that handwriting can communicate much more than ideas. It can tell us, in detail about the personality of the writer, his or her physical and mental state, and about the subject’s career aptitudes. The technique of reading these things from handwriting is called graphology. During the Middle Ages, Catholic monks practiced the art. Later, Shakespeare wrote: “Give me the handwriting of a woman, and I will tell you her character.” That’s not as easy to do today, as will be explained later. The first known book on graphology was published in Florence, Italy, in 1622. The author was Camillo (or Camilio) Baldi, and the title of the book was De signis ex epistolis (rough translation: “The Meaning of Letters”). It had a subtitle: “Treating of How a Written Message May Reveal the Nature of Qualities of the Writer.” Baldi was a professor of medicine, philosophy, and logic at the University of Bologna. He traveled around from castle to castle analyzing the writing of the lords and ladies. Serious study in graphology has started from the middle of the nineteenth century. It was then that Abbe Jean-Hippolyte Michon, a Frenchman, developed a set of handwriting signs. After that intensive research has been done by graphologists across the world to establish scientific basis for their findings. Today, the truly professional analyst is called a Certified Handwriting Analyst. He or she can get certified by the Handwriting Analysts International(H.A.I) after the training which takes 2 to 3 years. Most of the graphologists are used by business and industry as consultants. Obviously, one of the regrets that the society has is that there are hundreds of thousands of people who claim to be experts in graphology. They give the properly trained graphologist a bad name. Now you have a brief summary of the state of graphology —past and present. If you wish to learn graphology visit the official website of Handwriting Analysts International (H.A.I) – www.hai.in.